In a food processor add the flour, butter, egg and salt. Pulse for a few seconds to 1 minutes or until it resembles crumbs. Slowly add a few drops of chilled water until it comes together in ball. Take the dough out, wrap it in plastic and chill for 1 hour. When the dough is cold, turn the oven on. Preheat to 400F. On a slightly floured surface roll the dough into a 12 X15″ rectangle. Brush one half of the dough with a little water and grate around 2 oz Jarslberg cheese on top of it. Cover with the other half and press gently to make sure there are no big air bubbles in between. Grate some more Jarlsberg cheese on top. Using a pizza cutter cut the cheese sticks. 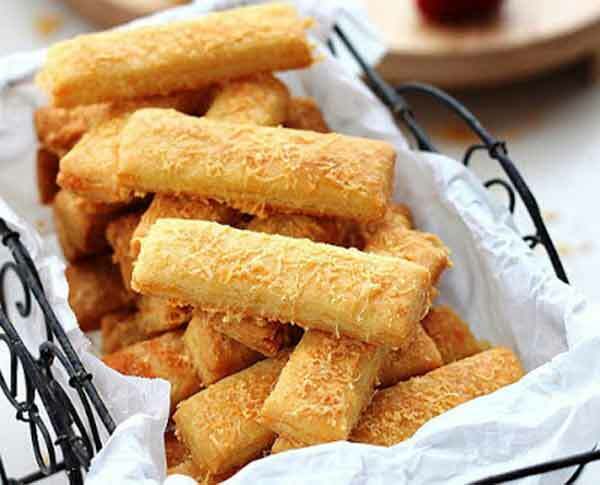 Place the cheese sticks on 2 baking sheets and bake for 10-12 minutes or until golden brown, according to Yummy.com.ph.